Many religious orders, especially missionaries, offer enrollments for people to benefit spiritually through good works, prayers, and Masses. If you do a search on the Internet with the words “Catholic Mass Enrollments,” many religious organizations will come up for you to choose from. One of my favorites is the Capuchin Mission/Seraphic Mass Association. This is the order which the recently beatified Father Solanus Casey belonged. He enrolled those who came to him for prayers in Masses. Many orders have updated technology, and communicate with email, but their preferred communication is through the mail. Consider writing an old-fashioned letter. You could also pray for them in return—we all need it— and although it’s not required, consider sending in a donation to help support them. Below are a few orders of cloistered nuns with prayer ministries that I found through the Directory of Women's Religious Communities. For even more communities, check out the list compiled by Epic Pew. 3. Dominican Sisters of St. Cecilia (Nashville, TN) are dedicated to sanctity of life and education. Go here with your prayer requests. 4. 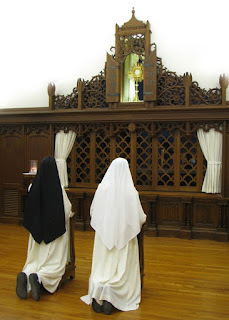 Carmelite Sisters of the Most Sacred Heart of Los Angeles, Alhambra, CA Request prayers here. (Ann Arbor, Michigan), dedicated to Education, Prayer, Retreats, Evangelization. Go here with prayer requests. 9. Franciscan Sisters of Perpetual Adoration, Lacrosse, WI, Request prayers here. 10. Sisters of St. Francis of the Martyr St. George have both active and contemplative. Go here and follow the link for prayer requests. 12. Franciscan Sisters of Perpetual Adoration are a community of vowed Franciscan women centered in Eucharist, committed to be loving presence through prayer, witness and service. Jesus told us, “For where two or three gather in my name, there am I with them,” (Matthew 18:20). By joining with others, we multiply our prayers and Jesus is in our midst. Consider joining a prayer group in your parish or one nearby or start your own pray group. The two groups below are international groups that branches in many dioceses across the country. 1. The World Apostolate of Fatima has groups across the country that they call Prayer Cells, where people can join together with their families to pray the rosary. Our family actually belonged to one for around ten years. 2. Cenacles of Life has prayer groups across the country dedicated to the sanctity of life. They pray two rosaries (ten mysteries) offering the rosaries up with fasting. They have a directory for group locations. There are also online groups you can become a part of. 1. The Society of Our Lady Healer of Hearts is an international prayer group of Catholic men and women, comprised of members of the clergy, religious, and the laity. They pray daily that Our Lady will heal the hearts of the world, filling them with unceasing love and abundant forgiveness in order to fully experience Our Lord's Divine Mercy. The Power of the Rosary offers a number of prayer groups people can join. Here is a list below. 7. Divine Mercy for the Dying They pray for the conversion of the whole world, especially those who are Dying. Members pray the Chaplet every day for them and each other. ​ “Oh, dying souls are in such great need of prayer”! St.Faustina. 12. The Adoption Movement: Saving Souls Its mission is to help save souls for the glory of God. The Apostle James said through the Holy Spirit, “Whoever brings back a sinner will save his soul from death and will cover a multitude of sins,” James 5:20. 14. The End of Abortion Movement: The Rosary is the Key The goal is to get as many people as possible to add “the end of abortion, contraception, and euthanasia to their daily intentions when they pray the Holy Rosary. You pray five decades of the Rosary per day and if you already pray it, just add the intention "for the end of abortion, Contraception, and euthanasia. 15. Eucharistic Adoration 2 End Abortion If people spent an hour a week in Eucharistic adoration, abortion would be ended, -St. Mother Teresa. Members spend an hour a week before the Blessed Sacrament or the Tabernacle to end abortion. 18. The Dolorians Want Peace in your family? We pray a set of short prayers that takes 2 minutes. 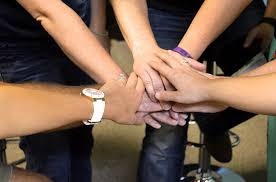 There are many promises plus each member prays for each other so that union of prayer also obtains even more graces. http://www.thepoweroftherosary.com/rosary-power-blog/the-dolorians.